Description: An extremely durable and robust ducting manufactured from a 2 ply rubber coated fabric fully encapsulating a spring steel helix. There is a further internal helix of steel wire. 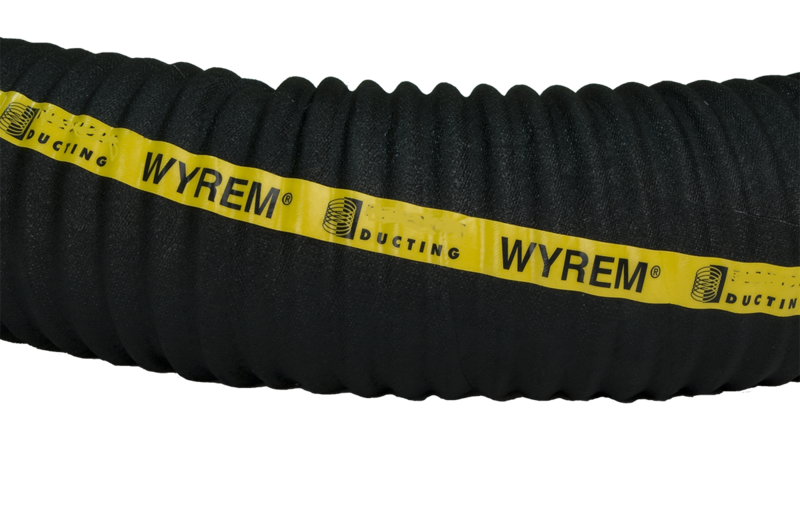 Wyrem has been produced and continuously developed over 5 decades to become the leading industrial ducting and almost a generic name across the field of dust and particle extraction. Temperature: -20°C to +100°C at 20°C ambient. Tube: Rubber coated cotton fabric. Cover: Rubber coated cotton fabric. Working Pressure: Wyrem is not pressure tight and should not be used in pressurised applications since the maximum accepted pressure is 35 kPa. Applications: A robust, durable and extremely flexible ducting suitable for a wide range of air, dust, fume and light particle extraction applications. It is especially suited to fine, coarse, organic and inorganic dust particle handling. Advantages: Durable - the double skin construction of cotton fabric ensures a product which is exceptionally robust and durable. Flexible - excellent flexibility permits a tight bend radius without kinking.